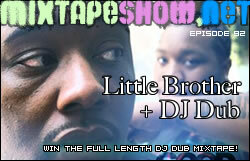 This entry was posted in episodes and tagged carlitta durand, chaundon, dj dub, episodes, lil wayne, little brother, phonte, rapper big pooh by dex digital. Bookmark the permalink. Mk so was that email a lie er you really sendin me one too?? AND i think you think i forgot, or you may not even remember yourself cause of the lovely green smokage, but whatever happened to that movie you were talkin about with the samurai from the motherland?..inquiring minds would love to know. man, y’all are going crazy with these ones! And Philip – check out Foreign Exchange – that should answer at least one of your hopes. The Pharrell thing could be cool too though, now that you mention it. Sara – not me! I’m clean as a whistle. I don’t lie, ever. I haven’t heard anything from my man in the motherland recently, unfortunately. Postproduction woes, probably. JUSTICE and LB? That sounds like it’d be really weird, but I’ve heard weirder lately…anyone up on edIT? Nice and simple…LB with Pete Rock & C.L. Smooth. Queue the horns. Peace. I CAN’T believe no one said these names yet, Lupe Fiasco, KRS-1,Justin Timberlake (on a nice hook), ANY member of the Wu-Tang Clan, and Nasty Nas, Esco, The “N”, QBs Finest, Nastradamus, NAS! I just want 9th Wonder back! But Phonte and Rapper Big Pooh are still doing there thing. Alright LB and Mos def with a few beats from black on both sides, and the new danger..
I’m thinking they should hook up with prince or even a group like the deftones or the gorillaz. LB seem like they could be pretty diverse in the style that they get with. I love when talent can switch it up and show catz that they can rock it from across the aisle. Peace out!! !